Today's ethanol blended fuels have positive and negative effects on marine engines. Ethanol is an alcohol made from corn. The ethanol is used as an octane booster so that less petroleum (oil based) gas is needed to provide the correct level of octane to operate your engine correctly and is cheaper to produce than petroleum gas. Ethanol blended fuels burn cleaner than non-ethanol fuels which results in less carbon build up in combustion chambers and exhaust systems and emit lower amounts of harmful pollution. They also burn colder than non-ethanol fuels which means less power. With ethanol blended fuels you have to push down more on the gas pedal in your car to go 55 mph than you do with non-ethanol fuels. This effectively lowers your cars fuel mileage. Ethanol fuels have the same effect on marine engines. One of the biggest problems with ethanol fuels in marine engines is water absorption. One of ethanol's characteristics is that it will absorb moisture from the atmosphere. Most (if not all) boats built before 2011 have an openly vented fuel system. This means that the fuel tank has an unrestricted vent to the outside of the boat. Car fuel tanks have a solenoid valve that automatically opens and closes to let air into the fuel tank as fuel is removed. Boat fuel tanks do not. When a boat is stored outside in the sunlight, daytime heating warms up the boat and the boats fuel tank. This warmth causes the fuel in the fuel tank to expand and some of it evaporates. These fumes leave the tank through the unrestricted fuel tank vent system. When the sun goes down at night the boat and fuel tank cool down and there is a contraction of the fuel tank and fuel which pulls air in through the fuel tank vent system. So, your boats fuel tank is expanding and contracting (or breathing) on a daily basis. In Texas and especially near the coast, there is a very high percentage of moisture(humidity) in the air almost year-round. This moisture is absorbed by the ethanol fuel. The ethanol fuel turns this moisture into a tiny (almost microscopic) ball of water and suspends it in the fuel. In this condition your engine can burn the fuel even though it has water suspended in it without any noticeable running issues. The problem is that ethanol will keep absorbing moisture to the point that it is saturated with these tiny balls of water. These tiny balls of water start colliding with each other and create larger balls of water. These balls of water will continue to grow in size as the ethanol absorbs more water. The result is that the ball of water becomes too heavy for the ethanol to keep suspended in the fuel. The large balls of water then sink to the bottom of the fuel tank making room for more little balls of water. As this process continues, water begins to build up on the bottom of the fuel tank. As this continues another problem develops. The ethanol will begin to separate from the petroleum gas it is mixed with. This is called "phase separation". This process causes layering to occur. The bottom layer is water with a layer of ethanol on top of it, and then a layer of low octane on top of that. if you premix your outboard motor fuel tank with two stroke oil, a fourth layer will develop on top of the petroleum gas. This is your two-stroke oil. When the level of water gets high enough to be picked up by the fuel tank pick up, it goes into the engines fuel system causing it to lose power or stop running altogether. This can create dangerous situations which could lead to personal injury, property damage or even death. To stop this from happening Alvin Marine suggests treating your fuel with a fuel stabilizer additive designed to control water absorbed by the ethanol fuel. Our testing of various additives has uncovered a product that works above and beyond all other additives tested. 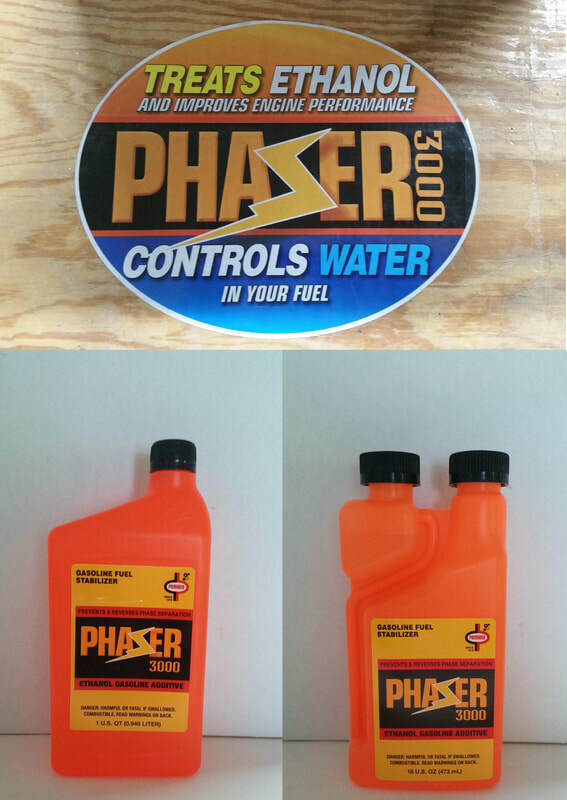 Phaser 3000 made by Primrose oil company in Dallas, Texas works as an excellent fuel stabilizer that not only controls water absorbed by ethanol, it can remix phase separated fuel. This product preserves and extends the life of ethanol fuels, lowers the evaporation rate of the fuel and uses a lubricant that encapsulates the tiny balls of water which keeps them from getting any bigger which in turn keeps them suspended in the fuel to be burned. For phase separated fuels, Phaser 3000 can break down water on the bottom of the fuel tank back into tiny balls while remixing the ethanol and petroleum gas back into usable fuel. If your using ethanol blended fuels you MUST treat your fuel and Alvin Marine LLC highly suggests the use of Phaser 3000 and the installation of an in-line water separating fuel filter as an extra precaution to keep any water from reaching your engine. Failure to do so can result in bad memories of failed boating trips and costly repair bills. Try Phaser 3000 today. Ken Wood owner of Alvin Marine LLC is a Factory Trained & Certified Marine Technician with over 30 years in experience in the industry. In the Galveston Bay and surrounding Bay systems the water stays stirred up by Barge traffic and normal Tidal action. This water contains large amounts of sand and silt and also contains living organisms such as algae. This algae is pulled into the cooling systems of marine engines navigating the waterways. Algae prefers a very warm, and wet environment to grow and will attach itself to the insides of cooling systems, preferably in the cylinder heads of Outboard engines right above the combustion chamber where it is nice and warm. The algae seems to prefer the 120 - 140 degree temperature range. If the environment that the algae is in stays warm and wet, the algae will say alive and grow (similar to grass) to a specific length, then will slow down and maintain itself. However, most of the time people aren't using their Boats on a daily basis. This allows the algae to dry up and die. Over hundreds of times of this cycle occurring, the dead algae will build up and over time will cause a heat transfer issue. This layer of dead algae slows the transfer of heat from the metal of the block and heads, to the water that is running through it to keep the engine cool. The result is an engine that will overheat at full throttle or higher RPM's. This problem is found more frequently in Johnson/Evinrude, Yamaha and Force Engines. The problem does not seem to occur in Mercury outboards due to a yellowish green film that is applied to the cooling passages of these engines during the manufacturing process. The repair of this heat transfer issue requires the removal of the cylinder head (s) and a complete cleaning of the cylinder head (s) and block. Alvin Marine offers this service. Please feel free to give us a call or come by and see us today. Grease Trailer wheel bearings every month if Trailer is used weekly. Failure to do so can cause severe and extensive damage to wheel hub axle spindles. Check wheel bearings to make sure that they do not move. To do this, be sure to chock a wheel that you are not checking so that the Trailer does not move. Next, push in and pull out on the top of the wheel. If the wheel moves, this indicates that there is slack in the bearing and they need to be adjusted and repacked with grease. Alvin Marine provides complete Trailer servicing. If you have questions regarding your Trailers wheel bearings, feel free to call or come by and see us. 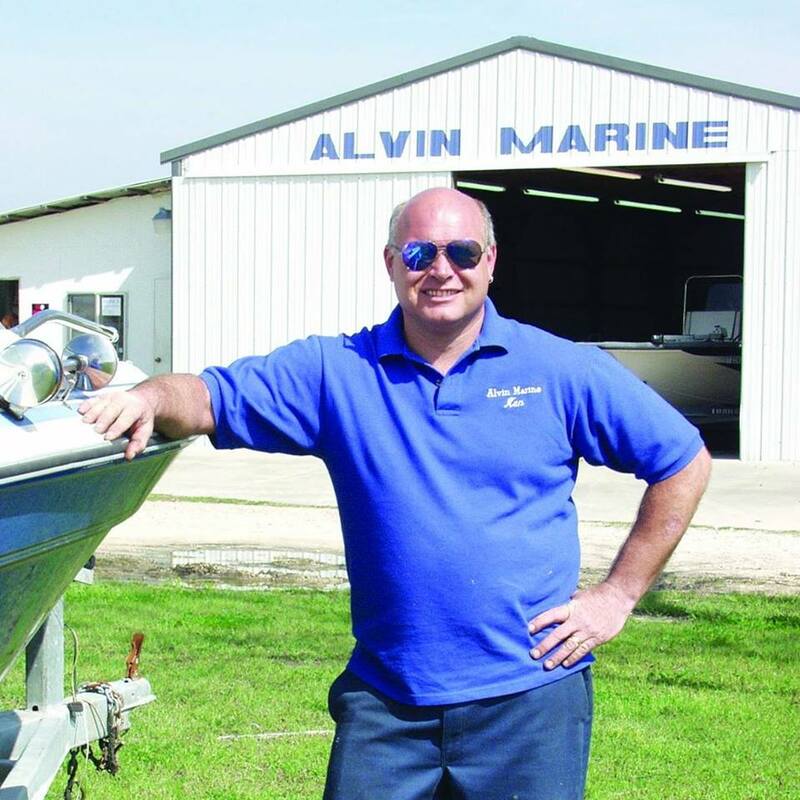 Ken Wood owner of Alvin Marine LLC is a Factory Trained and Certified Marine Technician with over 30 years experience in the industry. Replace all fuel filters annually. This will help prevent buildup of debris in the fuel filters that can clog filters causing a loss of power at higher speeds. This loss of power can cause serious engine damage and expensive repairs. If you have a water separating fuel filter in your boat, I recommend that it be inspected every other month. If your boat sits outside, in the sun when not being used, I recommend that the water separating fuel filter be checked every month. To do this, locate the fuel filter in the boat. Using an oil filter wrench, unscrew the filter clockwise. Empty the contents into a quart sized glass jar. If the fuel appears cloudy, or you have separation of layers on the jar, your filter must be replaced and the fuel tank needs to be pumped out to remove the water in the tank. Alvin Marine can provide these services, and we also stock a wide variety of water separating fuel filters, and engine mounted fuel filters. Feel Free to call or come by and see us. Ken Wood owner of Alvin Marine LLC is a Factory Trained & Certified Marine Technician with over 30 years experience in the industry. Remove Propeller frequently (every 3rd or 4th trip) and check for fishing line on the Propeller Shaft. Fishing line can get into the Propeller Shaft and create a Gear Lube leak that you may not notice until the Lower Unit Gears fail form a lack of proper lubrication. This can be a very expensive repair. This is more important to Fishermen who frequent popular fishing spots where larger amounts of fishing line can be found. If you do find fishing line on the shaft, remove it, grease the Propeller Shaft and reinstall the Propeller. Next, check the Gear Lube for water intrusion. If there is water in the lube it will come out looking like clear water, or the oil will look white and creamy. If you find this, change the gear lube immediately with proper lower unit gear oil. It is possible for the propeller shaft seal to be damaged by fishing line. If you suspect seal damage, the Lower Unit must be pressure and vacuum tested to verify the integrity of the seals and O-rings that keep the oil in, and the water out. Alvin Marine can provide all pressure and vacuum testing services and we also stock different types of gear lube depending on the Manufacturer of your Engine. Please feel free to call or come by and see us. Winterizing your Boat or preparing for long term storage is necessary even in the Houston area. Untreated fuel in fuel tanks and fuel systems will go stale, absorb water and gum up critical fuel system components. Sitting for more than 6 weeks without use will result in poor Engine performance and the Engine may not start at all. It does occasionally get cold enough in the Houston area to freeze-damage cast iron cylinder blocks and exhaust manifolds found in Inboard/Outboard Boats. These Engines are Automotive style Engines that have been modified for Marine use. These Engines use the water that the Boat is being used in to cool the Engine. If Engine cooling water is not properly drained, it could freeze if temperatures drop below freezing (32 degrees Fahrenheit or 0 Celsius) for 10 hours or more. The freezing water expands inside the Engine causing extreme pressure and can crack the cylinder block, cylinder heads and exhaust manifolds causing major damage and the need to replace the Engine and manifolds. For expert advice on Winterizing your boat and motor. Call or come by and see us. Ken Wood is a Factory Trained & Certified Marine Technician with over 30 years experience in the industry.